Nick Clegg's spin on issues such as the NHS, the environment and child detention didn't quite match the facts, in his Liberal Democrat party conference speech. Nick Clegg recieved the traditional leader’s standing ovation at Liberal Democrat conference this afternoon. His speech was probably easier to write given he had a slightly skewed view of the last year-and-a-half of coalition government. For example, the Lib Dem leader argued the coalition’s package of public sector cuts was the only reponsible course of action – to disagree was to be irresponsible. Yet the cut in demand and resultant slowed growth may lead to the deficit actually being greater than projected under the Alistair Darling plan. “While in March the OBR was slashing growth forecasts for just this year, we’re now facing a “lost decade” (the IMF’s words not ours) and growth is being serially downgraded. 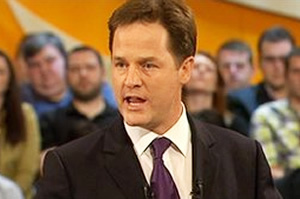 One of the biggest cheers in the hall came for the Liberal Democrats’ stance against child detention – it was, according to Clegg, what made it worthwhile to lose seats. However, this has not been acheived yet. Despite progress, two deadlines have already been passed. There was then the great boast that raising the income tax threshold – which to be clear does not help those on the lowest incomes but those on low to medium incomes – was a great act of social justice. Yet the burden has merely been shifted from income tax and National Insurance to VAT, and the poorest lose out as a result. Then there was the rallying cry of the green agenda. While how green this government has been can be questioned from lots of angles, perhaps the most iconic is the question of nuclear energy – where the balance of opinion has been more firmly against than the other two parties. Yet the industry is recieving hidden subsidies from the government. And of course, the health service has not been safeguarded by Clegg’s “fighting to keep the NHS safe”. Maybe if Clegg read Britain’s number one left-wing blog more often, he could catch up with the facts. Please could someone spell check this article – recieved and acheived! Dear Gillian, our apologies! The errors have now been fixed. …and those on high incomes, if you look at things in terms of households’ position on the income distribution rather than in terms of individual earnings. A single person on £40,000, a childless couple on £30,000 each, and a family with one parent earning £100,000 and one earning £20,000 would all benefit by at least £1,000 – but none would be anywhere near the middle of the income distribution. After hearing the speech live I came away with the feeling it had been much more about Clegg attempting to chart a course for his own political survival than any concern for improving the state of the country. I’m afraid Clegg, like the rest of the government, is not keeping up with economic reality. Clegg’s speech was very poor – schizophrenic on the economy, petty on politics and disingenious about some of the fundamental facts of both Labour’s record and his own thus far in government.